I wanted to share some of the links I've been enjoying lately. 'K? And I've included a gratuitous breastfeeding picture of Mikko, because I figured this post needed some eye candy. Yes, I just referred to myself as eye candy. Don't hate me because my breastfeeding's beautiful. Little Ivey at Babyfingers is taking longer to take to solids, just like my own child. I'm always glad to see similarly paced children with sensitive gag reflexes — so I know we're not alone! And check out that post-nursing grin. ETA: Inder Loves Folk Art also has a baby-led weaning post with an adorable chubby baby. Fantabulous article from Honest 2 Betsy on the shaming everyone does to mothers. Laugh and sigh over Nurse Chin Hair and the ultrasound tech who fights with a fetus (and loses!). Get mad that no one compliments your mothering — and then get busy handing out some affirmations of your own. Here's mine for the day: If you are reading a parenting blog, chances are you are taking this mothering gig seriously. Good for you, and good mothering! Kourtney Kardashian: Future Lactivist? from Blacktating — Do you hate the Kardashians? Maybe you won't after reading this breastfeeding quote. Go, Kourtney! Also from Blacktating: Stephen Colbert learns the proper way to feed his Grammy — Oh, my gosh, the laughter. Sad news via Mama Knows Breast and Motherwear's Breastfeeding Blog: Breastfeeding 1-2-3 is no more, after the parent company terminated all the bloggers' contracts. That's been one of my favorite breastfeeding blogs, and Angela brought such a wealth of information and community into the breastfeeding blogosphere. I hope she can find somewhere else to set up shop! Send Motherwear a breastfeeding tip or story and be entered to win a $100 gift certificate for nursing wear — and stop by to read a hilarious nursing story from a 3-year-old! You can also click to read previous funny and moving breastfeeding stories, which I recommend doing. Read an inspiring review of Ann Sinnott's Breastfeeding Older Children at Breastfeeding Moms Unite! (inspiring in the sense that it will make you want to buy the book! ), and take Melodie's poll while you're at it: How old is your nursling? Learn to listen empathetically and help your children name their emotions in Dealing with children's feelings at Code Name: Mama, great advice from the book How to Talk So Kids Will Listen & Listen So Kids Will Talk . Similarly helpful, The Parent Vortex offers advice on How to deal with a tantrum without having one yourself. The author lost her original draft of this post and managed to keep it together, so apparently her tips are working! I just love that she brings together advice from Raising Our Children, Raising Ourselves, Playful Parenting , and The Happiest Toddler on the Block in a cohesive and practical way I can really grab hold of and use. Are you mad at Facebook for deleting breastfeeding photos? You will be. Check out Eclectic Effervescence's ecstatic tandem-nursing photo of preemie twins, and hear her ludicrous experience with Facebook. Welcome earthside little one... I am your mama. from Wild Mother Arts — delicious. One Hot Mama takes on the CPSC Warning on Baby Slings and is interviewed by NBC4. There is one type of deep-bag baby sling that has been recalled (image here, via BirthRoutes), but the media response to the recall information from the CPSC has been very alarmist about babywearing in general. (And you'll notice they're not crying out hyped-up warnings about never again using strollers, plastic infant car seat carriers, and cribs. Hmm.) ETA: Just came across this anti-alarmist MomLogic interview with the maker of Rockin' Baby Slings. Rhythm and song from Cypress Sun — "Yes, you will die. How will you live until then?" Lisa at My World Edenwild eloquently explores the difference between elimination communication and potty training. I also love Natural Parenting's succinct reason for EC: "We practice elimination communication, because we know that we would want help using the bathroom if we couldn’t do it on our own, and we feel he deserves the same respect." Whenever my mother-in-law visited during our EC days (and don't let your minds go to stereotypes, because she's a wonderful woman in general), she questioned whether EC was "worth it" if potty training didn't happen early. I always fumbled to give the reply I knew was in my heart somewhere. These two bloggers have helped me voice my reasons why EC is worth it, no matter what "outcome" there is, because it's the process itself that's important. The Ninth Carnival of Feminist Parenting is under way at Mothers For Women's Lib. There's a whole bunch MORE links for you to read! Join Food Is Fuel Friday at The Urban Momtographer. Read the explanation behind Food is Fuel Friday here, and link up your posts about real food that declare this message: It matters what I feed my family. Strocel.com's Crafting My Life series is talking about blogging this month. On the last Thursday (Mar. 25), Amber will to link up your posts about the theme. Of course, I have to plug this month's Carnival of Natural Parenting: Vintage green. 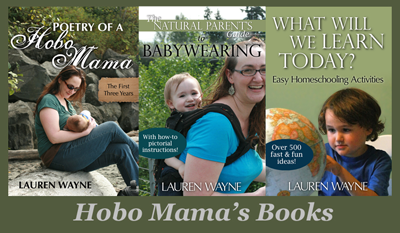 Awesome assortment of stories and tips on eco-friendly (and/or cheap) parenting! And make sure you enter my giveaway for a Mini Mei Tai doll sling before it ends next week, Mar. 18. Guaranteed not to be recalled by the CPSC! That's enough to read for now, no? I'm sure there are other gems I'm forgetting (I really should keep a running list as I read), so feel free to add any helpful posts in the comments, even your own. I won't mind, really! P.S. I have 99 followers. Anyone want to make it an even 100? Thank you so much for including me! Now I am off to do some reading. Yay! You are beautiful, and your baby and your breastfeeding too. What a gorgeous breastfeeding picture! Definitely eye candy to this mama :) Just beautiful! Thanks so much for including my blog in your links - I'm so happy you're enjoying it. I'm starting to adore this blogging thing. It's addictive! thanks for the link love. i'm just catching up on my blog adventures...and wow, your place looks marvelous! nice changes!